Florida State's Jameis Winston picked up his second save last week in a win over South Florida. Jameis Winston continues to be nearly unhittable this season. 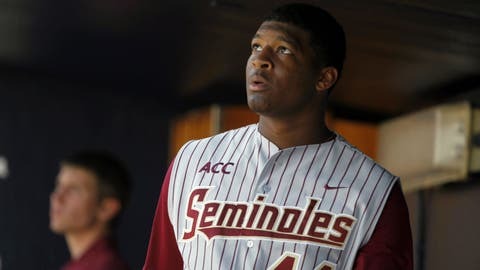 The Heisman Trophy winner pitched a scoreless ninth inning, picking up his second save, as Florida State won 4-1 on Wednesday at South Florida. Winston also had an RBI double in the first against the Bulls. He was the starting designated hitter in Friday’s home game against Maryland but went 0 for 4. It was a good week for No. 2 Florida State, which went 4-1 to improve to 12-2 this season. Winston continues to make his biggest impact on the mound. He has allowed just one hit in six innings. He has three strikeouts and no walks. Winston has three hits in 12 at-bats (.250) this season. He has scored two runs and has an RBI. How will Florida State handle its third defensive coordinator in three seasons? Winston did not play in the outfield this week. Florida State plays at Central Florida on Tuesday and Wednesday. The Seminoles return home to host North Carolina State for a three-game series beginning on Friday. Winston will be playing football and baseball this spring, so he will be even busier once the football team opens practice on March 19. On days when the football team is off, Winston will play baseball.